As long as I can remember, my father will wake up early on every Saturday morning and make breakfast for the family. My mom and I get to sleep in while he goes to the grocery store to get what he needs and then whips up a simple but phenomenal meal. I’ll wake up to the smell of onions frying in a hot pan and sweet pancakes sizzling on a buttery griddle. It’s one of my favorite family traditions. 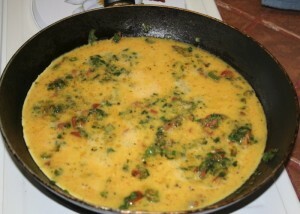 Abbu starts with an egg scramble. 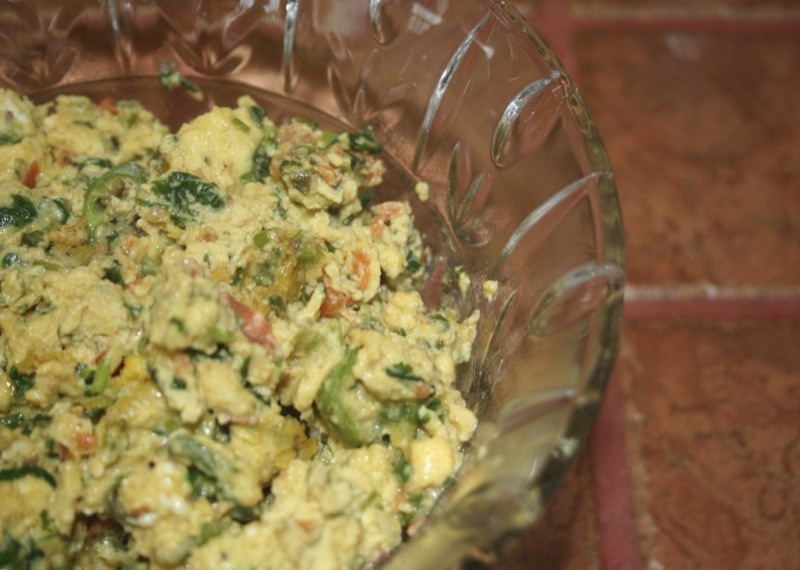 My grandmother in Islamabad is famous for her “Anda Aaloo” – an egg and potato scramble that she gets up early to make, dicing the potatoes into little tiny cubes that melt into the egg and tomato. Abbu has carried on the tradition. He’ll dice up onions, tomatoes, spicy chili peppers, and sometimes potatoes and fry them all in a pan before adding in eggs that he’s whipped with milk to make them fluffy. 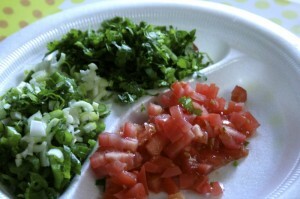 He spices the scramble with fresh chopped coriander leaves, cayenne, cumin, salt, and pepper. They’re beautifully colorful and delicious……except once, when at my eldest uncle’s house in Charleston, SC, Abbu mistook cinnamon for cumin and we had some interestingly-flavored, brownish eggs that morning. His big brother has teasingly but lovingly never let him forget it, either. (“I mean, I know you’re his daughter, Taiyyaba, but come on….those eggs were bad.”). The eggs are served with biscuits, hot from the oven. Course two is fluffy pancakes with syrup. He puts lemon juice and baking soda into the batter, and when the acid reacts with the base, it leavens the pancakes and makes them super fluffy. Sometimes I help him out here by mushing bananas for the batter and making a cinnamon-banana maple syrup. 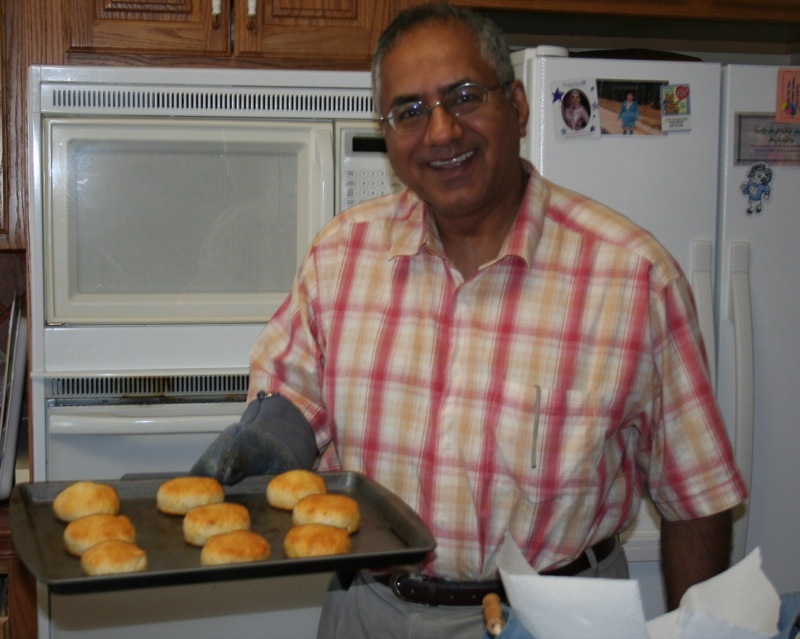 Abbu is the expert at actually cooking the pancakes. I don’t know what he does, but they turn out crispy on the outside and soft and tender on the inside, every time. Abbu also makes some sort of potatoes with the eggs, usually french fries. Every kid’s dream, eh? French fries for breakfast! The meal presentation is always beautiful, too. Abbu will put a generous serving of everything on our plates, which are decorated with thin slices of apple or orange or a colorful fresh fruit salad. With everything done, he calls everyone to the table for breakfast. We’ve got our own eating traditions, too. While we eat, we always have a discussion about why Ammi eats her french fries (or hash browns) with maple syrup instead of ketchup. She likes the savory-spicy-sweet combination. 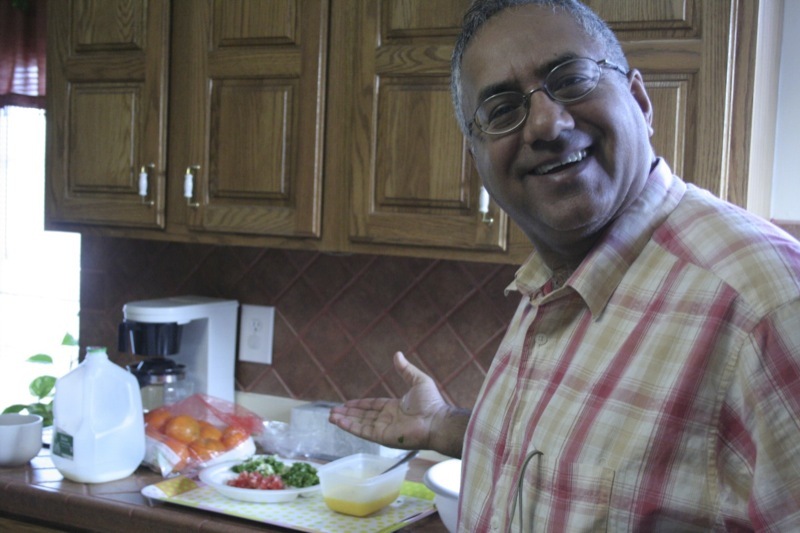 (Okay, okay….I used to think it was weird but now I like it too, and so does Abbu. We’ll convert Ameir eventually.) Abbu will always start eating and say “Oh! Best breakfast I have ever had, because we are together.” And then, at the end, he’ll lean back and pat his stomach and say “Ohh….I ate too much,” or, more often, “Taiyyaba, you let me eat too much.” (Ameir’s starting to do the same thing now, too). We top it all off with some hot tea. This whole experience is one of our favorite times of the week because it lets us get away from all the school and housework and just spend some real family time together! I do all this because I love my family. You are so very special to me. I will keep doing this exactly for the reasons you have stated in your beautiful write-up. You get twice the serving next time! you are such an adorable family, mashallah. kind and loving, you embody the wish every person has for their family to be. everyone who knows you is so incredibly blessed to have been exposed to your beauty, inner and outer. you keep me praying daily that nothing will ever separate us, in this life and in the hereafter. may allah’s mercy ease your pains, brighten your life, and give you strength in times of need. Thanks meemz! it takes a very special person to write what you wrote for our family! remember – we are part of the same family – like one body! if one part hurts the rest or entire feels the pain – and likewise, if one is happy – all are happy! simple logic but meanigful to one who cares! I KNOW that you do. omg!! if i didn’t already love you all anyway i’d be choking on the sweetness here 🙂 but as things stand, i have to just… agree!! maryammmmmm ya hit dem nailz on de heds.